IP university law entrance exam notification will be released in November 2017 and it is expected that the IPU CET LLB Exam will take place on 19 May 2018. All students who have their names in the merit list will be called for IPU CET LLB Counseling 2018 and the focus of this article will be on what entails IPU CET LLB Counseling and how IPU CET LLB seat allotment is done by counselling. The IPU CET LLB counseling 2018 schedule will be notified on the IP University websites ipu.ac.in by June 8, 2018, and students should regularly visit these websites to check if they are eligible for IPU CET LLB counselling and for other related details. The university will complete the IPU CET LLB counselling 2018 process by July 2018. Those who have got an IPU CET LLB counselling call must first pay a non-refundable fee of Rs. 1000. Students who pay will get a receipt. Online payment can be made on the website www.ipuadmissions.nic.in from the option named " payment of counselling participation fee". Post that for registration to IPU CET LLB counseling 2018 you will be asked for relevant information such as your roll number of the exam, your date of birth and mobile number. Pay either offline or online and take a print out. As mentioned above you have to register for IPU CET LLB counselling and IPU CET LLB seat allotment after payment of counselling fee. For registration for counseling, you will need a payment fee receipt issued to you at the time of counselling payment. Those who pay offline will have to register 48 hours post making payment to any bank in India. The counselling fee payment does not mean that you are entitled to admission and IPU CET LLB seat allotment. This is just the fee for appearing for the law entrance exam counselling rounds. This fee payment is the step 1 of counselling. Next thing to do is filling your choices stating college and course choice preference. Fill all options so that there is a high chance of getting the institution and course of your choice. You will be allotted a seat as per your rank and preference. Part admission fee payment print out. Point to note that once a seat is allotted out of those institution and course choices then admission fee of Rs. 40,000 has to be paid on the spot to lock the seat. This fee will go towards college admission fee and will be adjusted there. There is something called freeze the seat. If a student is okay with the seat assigned then one can freeze the seat. If a student does not freeze the seat then he will be called for the next round of IPU CET LLB exam counselling and will be offered a seat higher on their preference list if the same is available. One can also withdraw from counselling if he no longer wants the seat assigned then he or she can ask for an admission fee refund. Post refund of this fee the said candidate is removed from the list of participants for counselling of the IPU CET LLB exam. One has to withdraw from counselling before the last round of counseling comes to an end. Another prominent point of the last round of counselling is that then all reserved seats are turned into unreserved. There is then a special round in the law entrance exam admission process called sliding round where all students who have been assigned a seat, have frozen their seats and not withdrawn will be called and they have to pay the remaining fee left after depositing 40,000. The preferences chosen by these candidates remain the same as chosen by them earlier. These sliding round students will then be asked to report to the college assigned along with their admission slip, college offer letter, receipt of fee payment and documents necessary. No student will be given official admission without documents and without the documents, one would lose their seat. If colleges report that some seats are still vacant after all IPU CET LLB counseling rounds then spot counselling takes place. Therefore this round takes place once IPU CET LLB exam admission process is otherwise complete. This round is offline as in students have to be present physically at the decided venue. Counseling fee for this particular round is Rs. 2000. 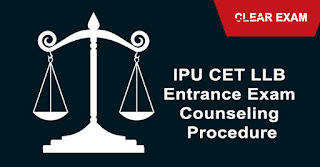 That is how IP University conducts its IPU CET LLB seat allotment Top Law Colleges in India accepting IPU CET LLB Score through the counselling process. Candidates can read the post to know on IPU CET LLB counseling 2018 including the counseling process, seat allotment and admission dates.